Cloisonné Enamel Earrings- Sol Fusion with Mexican Opals. 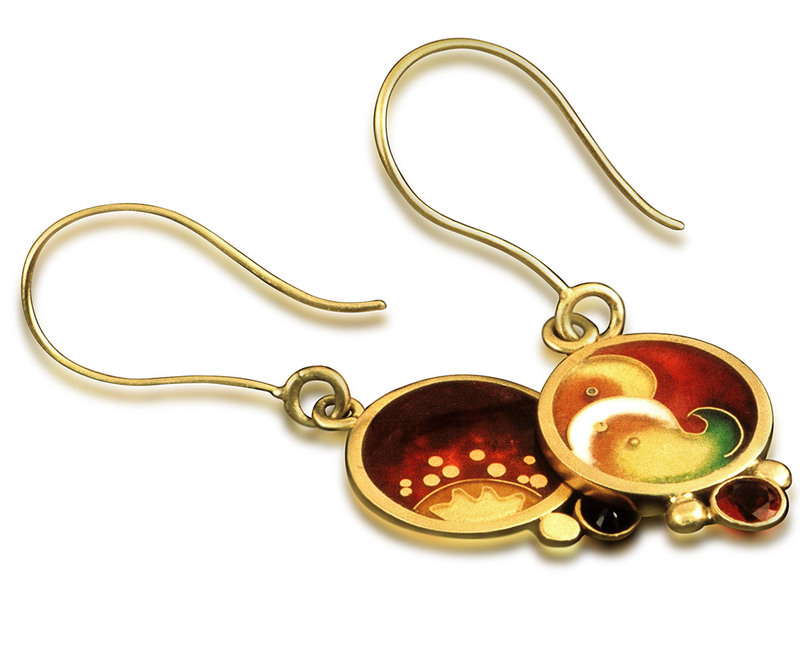 Sol Fusion is a cloisonne jewelry piece created by Patsy Croft. It belongs to Holiday collection of amazing enamel jewelry with unique jewelry designs. These beautiful cloisonné enamel earrings are very exciting to me as I spent many year experimenting in the process of fusing fine metals together to create a jewel I could enamel on. Now you might say you can enamel on copper or fine silver, etc so what is so special? Well, several things to notice here. This is a stand a lone unit. Gold cloisonné enamel earrings. Not a enameled piece that needs to be placed in a setting. After I build these jewels I can enamel them. In most cases enamel jewels are placed in a setting. Which is great but in some cases I want to be free of the settings. And here I am. They are enameled on two sides of the earrings, which metal has to have enamel on both sides to avoid cracking. If you enamel both sides what not have something beautiful on each side to enjoy. In the photo you can see what I an talking about . This was also a common practice in the 1500. The owner was to only one to enjoy the back of the jewels. A little secret of their own.